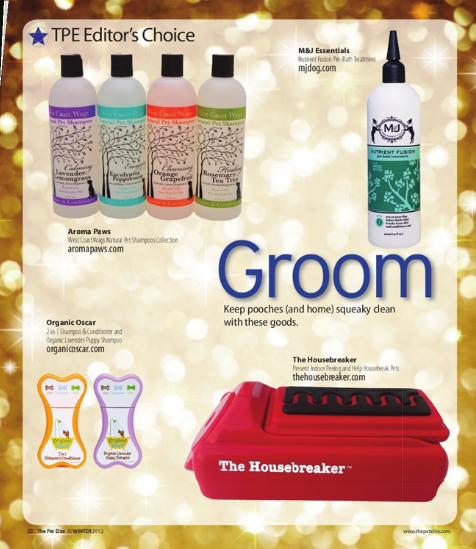 The Pet Elite Magazine has named The Housebreaker an Editor's Pick in their Winter 2012 magazine. We are honored to be recognized in one of the elite pet care industry magazines. AKC features The Housebreaker Kit in the 2012 Gift Giving Guide "Perfect Presents"
We are proud to announce that The Housebreaker Kit has been featured in the 2012 American Kennel Club's Annual Gift Giving Guide "Perfect Presents". 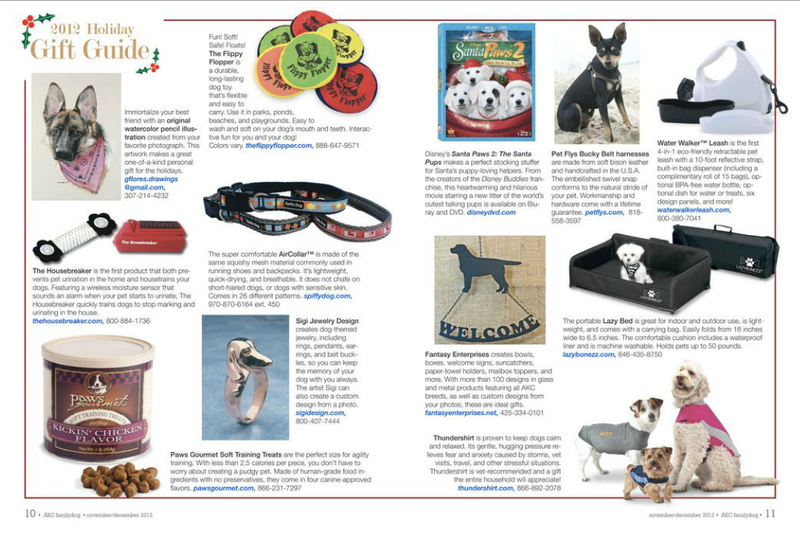 The annoucement was made in the November/December 2012 Family Dog magazine featuring 21 of the year's most innovative and unique new products for dogs. The Housebreaker Kit was the only training product in the article and was chosen from a very long list of other products to be featured in the coveted Annual Gift Giving Guide. When should new pet owners start potty training? Puppy potty training begins on the first day the pet is brought into a new home. If you find that you have an adult dog that has not been properly potty trained, begin retraining your dog. Although it may take longer - old dogs can learn new tricks. What are the Top 3 Mistakes Many Pet Owners make? There are many things that pet owners do that will actually make potty training their pets more difficult or even work against you. There are 3 that make the "biggest mistakes" list and some are very familiar. 1. Allowing a dog to have even one accident in the house. Once an accident has occurred in the home, the dog has a memory of the incident and, until the carpet is torn out and replaced - there will always be a scent that your dog and other dogs can find in that spot. 2. Putting your dog's "nose in it". This is an old-school form of punishment that has been found proven ineffective and can actually make matters worse. This is similar to putting a baby's face in a diaper. Not only is it cruel and confusing, it can cause infections in your dog's face from the bacteria. If you don't catch your dog in the act - you missed your opportunity to make a correction. Clean up the mess and make sure another accident doesn't happen. 3. Allowing an untrained pet to roam the house unsupervised. Most people wouldn't let a baby roam their house without a diaper - the same consideration should be given to a dog that is not fully house trained yet. Until your dog is housetrained fully - constant supervision is key. What are the BEST practices for housebreaking a puppy? There are 2 Key Things that pet owners can do to potty train their pup with ease. Doing these things will make the process quick, simple, and painless. 1. Frequent Walks. Young puppies need to be taken out after every time they are done playing, after waking from a nap, after eating and after drinking. Don't just put the dog outside - go out with him to make sure he moves around and eliminates before coming back in. 2. Constant Supervision. A puppy cannot have an accident if you are always watching it. Fortunately, there are 2 essential tools to help you: a crate and The Housebreaker Kit. A crate will be a safe place for your pup when you are away from home - providing a "bed room" for your pup to sleep and stay out of harm. The Housebreaker Kit will be your new best friend when you are home - preventing indoor accidents and alerting you immediately as soon as the pup tries to pee inside. What is The Housebreaker Kit and how do you use it? Since it is crucial that you catch your dog "in the act" - The Housebreaker Kit is a product that not only prevents pee from getting all over your house but also catches your pup in the act. The wireless Wet-Sensor will signal the Alarm as soon as your pup attempts to have an accident in the house. The Wet-Sensor is attached using the Attachment Sleeve directly against the urine source inside any commercially available diaper or belly band. It is easy to use, some parts are made in the USA, and costs less than even one carpet cleaning service. Does The Housebreaker Kit harm the pet? There is no shock or harm to the pet whatsoever. The Wet-Sensor senses the pee and sends a signal. The technology has been evaluated by the FDA, Canadian Medical Board, and European Medical Board and found to be safe enough for human use. If viewers want to adopt the puppy: Who do they contact? We are happy to report that the sweet orphan puppy, Winnie, found a home within 24 hours of her appearance on WZZM 13. Her new owner, Wendy, tells us at The Housebreaker that Winnie has been a breeze to train. Congratulatios to Winnie and Wendy on their union and "Thank You" to WZZM and Michelle's Rescue for helping this rescue become a "happily ever after" story. If you think you can't teach an old dog new tricks - think again. Two years ago a woman in West Michigan finally figured out a way to house train her 7 year-old Maltese (appropriately nicknamed Puddles) after he soiled her floors for 7 years - crushing the old adage about old dogs and their abilty to learn new tricks. After all other traditional methods failed (crate training, frequent walks, pricey enzyem cleaners, expensive services), she decided there must be a better way. While researching online she discovered a brilliant doctor in New Zealand who had developed a patented technology to help end nighttime bedwetting in children (enuresis). He had used the technology safely for over 20 years, perfecting it and getting a better than 92% success rate! As thrilling as this was - dogs are not exactly chilldren. It would take some redesign to make the technology work for dogs who want to pee all over your house. So that is what she did. She named the product "The Housebreaker" and now enjoys a home without pee in it. The Housebreaker helps you house train your dog by harmless behavior modification. The Housebreaker uses an Attachment Sleeve to clip a highly sensitive moisture sensor, the Wet-Sensor, to a Diaper or Belly Band. When your dog tries to pee in your house - the Wet Sensor sets off the Alarm. The pet is unharmed but hears the alarm and stops peeing. You then take the dog where you want him or her to pee and "voila!". Your dog quickly learns that peeing inside the house is off limits. The added bonus, on top of the quick and safe housetraining of your pet, is that there will never be any pee on your floors or furniture. The Diaper or Belly Band traps any pee - preventing the urine from soiling your home. 5% of the Proceeds from the sale of The Housebreaker Kit always go to charity. You would think American factories would be clamoring for more work right now but, instead, they are telling would-be clients to get their products Made In China. At least that is what hundreds of American factories told a Michigan based start-up in their search for a factory to produce a small cloth sleeve since August of 2011. Grand Haven, Michigan based start-up company, The Housebreaker, was seeking a simple, small mesh and flannel sleeve to be sewn. The sleeve would be used to hold a moisture sensor in place as part of a kit to help pet owners potty train their puppies. There are thousands of USA sewing manufacturers listed on hundreds of online contract manufacturing and sewing directories. However – none wanted to take on the project and would frequently suggest that The Housebreaker, Inc. find a manufacturer in China to make the item. Deflated, The Housebreaker’s CEO, Rua Gordon, had just emailed three companies in China to request production samples when she happened upon Fairway Products website. The site claimed that they “Create Nearly Anything you Invent” and they were located in Hillsdale, Michigan – less than three hours away from The Housebreaker’s headquarters. The next day, phone conversations with Steve Firavich and Davie Cloyd of Fairway Products started a process that would evolve The Housebreaker’s Attachment sleeve to be made of an innovative tri-layer neoprene that is Velcro compatible and holds a perfect paw-shape even after repeat washings. Not only is Fairway Products American – they included excellent innovation consultation to improve the product and manufactured at a competitive price. Rua Gordon was able to drive to the factory to personally participate in the manufacture of The Housebreaker Attachment Sleeve’s first production run, tour the facility, meet the team, and be home for dinner. Last week two samples came in the mail from China. They were poorly sewn and fell apart with normal handling. The Housebreaker Kit is developed by Michigan start-up company, The Housebreaker, Inc. The Housebreaker Kit utilizes a wireless, wearable Wet-Sensor to trigger an alarm when pups attempt to pee inside. The technology utilized has been proven to be safe by the FDA, Canadian Medical Board, and European Medical Board and effective in trials. The company produces pet products to help pet owners with potty training their puppies and adult dogs. In maintaining with their mission to support their community, The Housebreaker, Inc. gives 5% of proceeds to charity.